Senior filled many roles for state champion Black Raiders. Haley Ward didn’t wow people with statistics this winter. The Winslow senior didn’t average 20 points a night, flirt with triple-doubles all season long or emerge as the dominant post player in the league. 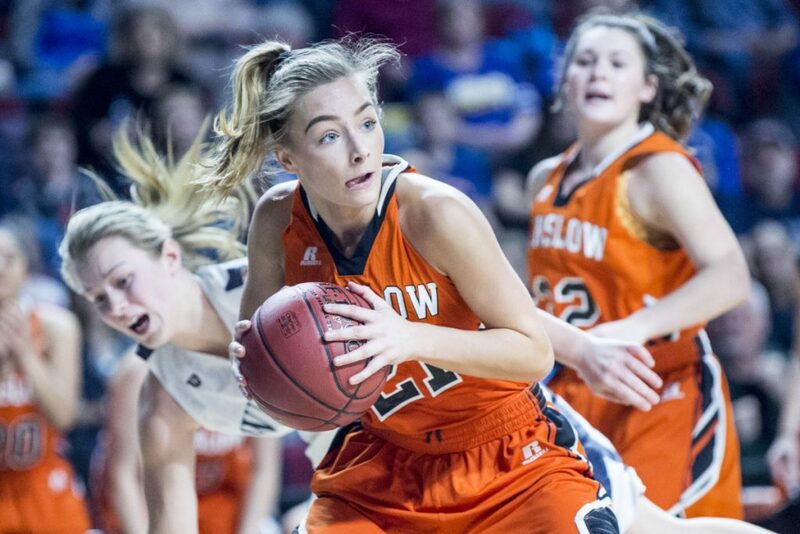 What Ward did do, however, was provide the engine for the Black Raiders’ Class B state championship win, taking on whatever role was necessary — night in and night out — to ensure that Winslow would win its first state championship in 13 years. Honorable mention: Carrabec: Bailey Dunphy; Cony: Cari Hopkins; Erskine: Jordan Linscott, Joanna Linscott, Alyssa Savage; Forest Hills: Demetria Giroux; Gardiner: Mikayla Bourassa, Leslie Stevens; Hall-Dale: Cat Kincaid, Kayla Searles; Kents Hill: Lauren Murray, Tiffany McGhie; Lawrence: Brooklynn Lambert, Keegan Alley; Madison: Sydney LeBlanc, Lauren Hay; MCI: April McAlpine, Sydney Morton; Messalonskee: Alyssa Genness; Mt. Abram: Megan Sorel, Lindsay Huff; Mount View: Andrea Crosby, Shala Davis; Monmouth: Kaeti Butterfield, Destiny Clough, Abby Ferland; Nokomis: Chelsea Crockett; Oak Hll: Abby Nadeau, Desirae Dumais, Sadie Waterman; Rangeley: Natasha Haley, Brooke Egan; Richmond: Caitlin Kendrick, Bri Lancaster; Skowhegan: Sydney Ames; Temple Academy: Deleyni Carr, Selam Heinrich; Valley: Kennedy Savoy; Waterville: Mackenzie St. Pierre; Winslow: Weslee Littlefield, Paige Trask; Winthrop: Aaliyah Falcone, Jillian Schmelzer, Katie Perkins. For her efforts, Ward has been selected as the Morning Sentinel Girls Basketball Player of the Year. Messalonskee’s Gabrielle Wener was also considered. Ward’s numbers were solid this season. She averaged more than 10 points per game for a team that averaged 49 for the season, had nearly four rebounds per game and shot 46 percent from the field. But the intangibles that Ward — who played two years at Cony before moving to Winslow prior to her junior year — brought were more difficult to measure. When the Black Raiders were on their game, it was no coincidence that Ward was on hers, too. “Absolutely,” Winslow coach Lindsey Withee said. “Whenever we had success, Haley brought that success. Even if she wasn’t playing well in a quarter here or there, she’d step up in the second half by getting a couple of rebounds or making a defensive stop. It wasn’t always easy for Ward. Generously listed at 5-foot-8, she was Winslow’s low post presence, often giving away several inches and several pounds to more traditional centers around the league. Because Ward wasn’t a true post player — though it’s what she grew up playing — she called upon a key element in her game: Stepping to the perimeter to hit mid-range and long-range jump shots. Ward shot 43 percent from 3-point range this season. So what Ward brought to Winslow was a certain versatility the Black Raiders grew to count on: Rebounds. Inside buckets. Steals. 3-pointers. Key free throws late in games. It all added up to a player who wasn’t going to wow you with a final stat line, but who left everybody recognizing the significant influence she’d had on games. “With so many amazing players around me, I didn’t have 20 points a game,” Ward said. “We had players who could get offensive or defensive boards. I tried to do whatever it was we needed.